Asbestos Workers: Asbestos was a popular material used widely in construction and many other industries. If asbestos fibers are enclosed or tightly bound in a product, for example in asbestos siding or asbestos floor tiles, there are no significant health risks. Asbestos poses health risks only when fibers are present in the air that people breathe. Asbestos is the generic name for a variety of fibrous minerals found naturally in rock formations around the world. Because asbestos fibers are strong, durable and non-combustible, they were widely used by industry, mainly in construction and friction materials. Commercial asbestos fibers belong in two broad mineralogical groups: serpentine (chrysotile) and amphibole (tremolite, actinolyte and others). Amphibole asbestos often contains more iron and resists acid and extremely high temperatures. Because of this, it has been heavily used in industrial furnaces and heating systems. However when inhaled, amphibole fibers stay much longer in the lungs than chrysotile fibers and they are more likely to inflict damage and cause disease, including cancer. Accordingly, amphibole asbestos has been drastically controlled and largely replaced. Chrysotile is the only serpentine asbestos that is found in almost all asbestos based products available today and is the main form of asbestos still mined. Chrysotile is different from the amphiboles both structurally and chemically. It is generally accepted that chrysotile asbestos is less potent and does less damage to the lungs than the amphiboles. How much asbestos is in a product does not indicate its health risk. If the asbestos fibers are enclosed or tightly bound in a compound, there is no significant health risk. One of the main problems with asbestos came from sprayed or "friable" (easily broken up) amphibole asbestos used in buildings until the 1970s. People working in construction, maintenance or in the renovation of older buildings should be particularly careful when handling this asbestos. Occupational Exposure to Asbetsos: The risks are greatest for workers in industries which produce and use asbestos, such as mining and milling. In the past, workers in these environments were exposed to 100 - 1,000 times more asbestos than today's workers. Today's strict standards limit workers' exposure and the ban of most uses of amphibole asbestos have reduced the risks. During renovations and repairs to older buildings, construction workers, tradespeople and other building maintenance workers may be exposed to very high concentrations of asbestos fibers. The environment and work methods of these occupations are more difficult to control than fixed workplaces, but most tradespeople are trained in the proper handling of asbestos-containing materials. Negligible levels of asbestos fibers are found in the soil, water and air, both naturally and from man-made sources. Asbestos concentrations in the air in rural areas are about ten times lower than those in larger cities, which are about 1,000 times lower than levels accepted in today's asbestos-related jobs. With such low exposure, environmental risks are negligible. Due to natural erosion, high concentrations of chrysotile asbestos fibers may be found in some raw water supplies. Conventional water treatment methods can substantially reduce asbestos levels and there is no evidence that swallowed chrysotile fibers are a health hazard. Buildings and Homes: Because it is a valuable reinforcing, insulating and fire-proofing material, asbestos was used widely in construction materials such as insulation board, asbestos cement, and floor and ceiling tiles. These products are very dense and do not release significant amounts of fibers under normal use. However, fibers may be released if these products are cut or damaged. There is also concern about vermiculite insulation which may contain small amounts of amphibole asbestos, principally tremolite or actinolite. These amphibole fibers may cause health risks if disturbed. However, there is currently no evidence of risk to your health if the insulation is sealed behind wallboards and floorboards, isolated in an attic, or otherwise kept from exposure to the home or interior environment. the amount of time since the initial exposure. When inhaled in significant quantities, asbestos fibers can cause asbestosis (a scarring of the lungs which makes breathing difficult), mesothelioma (a rare cancer of the lining of the chest or abdominal cavity) and lung cancer. The link between exposure to asbestos and other types of cancers is less clear. Health and Safety Manager. If you work in this area, determine whether asbestos is present before beginning work and take appropriate precautionary measures. If you are working in a situation where asbestos could be present you should be issued with respiratory protective equipment. Respiratory protective equipment includes facemasks, hoods and helmets worn to protect your lungs from asbestos. The type of respirator you use will depend on the amount of asbestos present and the type of job. Make sure you use the right equipment for the job, or you could expose yourself to asbestos fibers. If it does not fit, asbestos fibers will enter your lungs and you will be putting your health at serious risk. Your employer (or yourself if self-employed) has to train you how to fit, clean, look after and use respiratory protective equipment properly, and keep this training up-to-date with refresher courses. Tests need to be carried out to make sure that your facemask fits properly (it is an employer's duty to make sure you have a face fit test before using any kind of respirator) as if you have a beard (even stubble), wear glasses or have sideburns, certain types of respirators may not fit adequately. NEVER TAKE OFF YOUR RESPIRATOR IN A CONTAMINATED AREA, the damage asbestos dust causes is irreversible and may cost you your life. We have helped many people get experienced legal and medical help for their mesothelioma cancer and asbestos cancer cases. 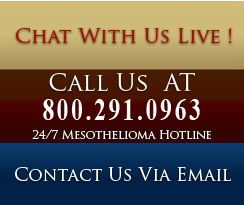 We will actually walk you the process of contacting an experienced mesothelioma lawyer that we have worked with to get you the best possible settlement for your mesothelioma case.